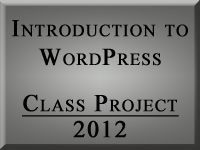 Created by the first WordPress class, student Alex Ferguson, these are the Final Project badges for your team projects. They are to be set in the sidebar of your team site. They are NOT to be changed or redesigned. This is an example of a sandbox post for testing WordPress Themes and web page designs to ensure every design detail within the content area of a Theme meets with your design needs. To use this sandbox post for your own testing, right click the following link and save the file as a text file. Open it within a text editor and select all of the text and paste it into your WordPress site with the HTML/TEXT editor – not visual editor. Save the post or publish it to view the post content designs. This is the link to the sandbox post text file. This sandbox post is available for free. Use as you wish. At the top of this paragraph should be the H1 heading for your web page. If it is not visible, the design settings for the H1 tag is set to display:none which many WordPress Themes use to hide the blog title text and replace it with a graphic. Do not use H1 within your blog post area. If the design in the H1 heading looks like your blog title or blog post title, then that is the style set for that HTML tag and you should not use it within your blog post area. Inside of this test data section are most of the basic HTML and XHTML and CSS styles that you might use within your WordPress Theme. You need to know what that will look like as part of structuring your styles. Above this paragraph should be the H2 heading for your web page. WordPress Themes use the h2 heading for various purposes. Logically, it should be either the post title or the first heading in the post content. However, it is used all over WordPress Themes including the subtitle, tag line, post title, comment area, sidebar area, and even in the footer. Be specific when styling each h2 headings to ensure you are not styling all of them. Is this the same heading as is in your post title or is this the section headings found within your sidebar? Or is it different? This is the post content heading for the HTML tag h3, as is the one below, H4, for section headings within your post to divide up topics. If there is an H3 or H4 tag in your sidebar, you will need to identify the parent HTML and CSS container for the sidebar and style those appropriate in your blog’s stylesheet. For more information in searching for your styles in your WordPress blog, see CSS: Studying Your CSS Styles. Also notice how the links in that paragraph are styled so you can style links within your post content area. Links have three styles. There is the link color, link hover color, and visited link color. Be sure and design for each style.